To facilitate and manage cooperative European Armament Programmes through their life cycle, as well as Technology Demonstrator Programmes (TDPs), to the satisfaction of our customers. A400M, BOXER, COBRA, ESSOR, FREMM, FSAF-PAAMS, LSS, MALE RPAS, MMCM, MMF, MUSIS, PPA and TIGER. The governance of OCCAR and the management of the OCCAR programmes is based on the OCCAR rules. Within its programmes, OCCAR manages the programme contracts with industry and acts as the Contracting Authority for the programme Participating States. To be a centre of excellence, and first choice in Europe, for cooperative Defence Equipment Programmes on a Through Life Management basis. 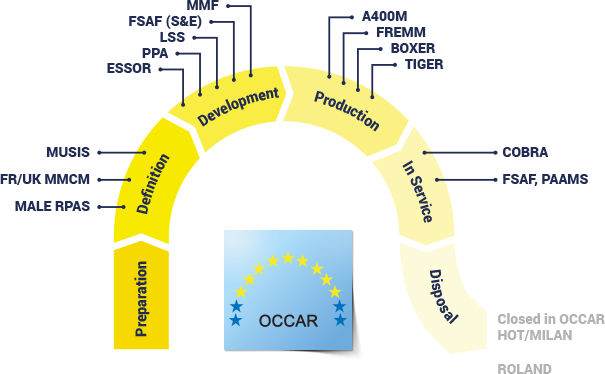 We are committed to OCCAR’s fundamental role in establishing a customer focused European defence equipment acquisition capability. We believe that these are the essential values for the achievement of excellence. We recognise and use the different cultures, skills and experiences of our staff and customers as drivers for innovation and continual improvement. We are committed to the highest standards of integrity in dealing with Nation’s financial resources, assets and defence systems.